Sixty-four percent of Americans age 18 and over start their day with a cup of joe. In other words, a majority of Stony Brook students are eager to wait in line 20-plus minutes at the Melville Library Starbucks for their daily dose of caffeine. Don’t get me wrong — sometimes I go to the Student Activities Center to get my fix because I’m impatient. But think about it: why are students, and even the others included in the 64 percent, willing to wait in line at Starbucks rather than in a shorter line anywhere else? It’s because Starbucks’ marketing techniques have us obsessed. If you look up #starbucks on Instagram, you’ll find over 32 million posts with colorful drinks, white and green cups with a black sharpie-written name and a lot of pumpkin spice. Starbucks drinks are always presentable, whether it be strawberries garnishing a refresher or just the aesthetic logo. Taking pictures of our food for social media has been a trend in the past few years, with 69 percent of millenials alone doing it for the ‘gram. Ever since this trend began, Starbucks has made their drinks more appealing to the public eye. They even adjust their cup decor with the changing seasons. Besides making the milk pretty in a macchiato, Starbucks also has a reputation of writing your name wrong on the cup. I know it’s happened to me a few times. Starbucks also always promotes high quality customer service through its employees. So if a customer gives them an odd name, they have to write it on the cup. Next comes the Instagram or Twitter photo emphasizing the joke but also the green mermaid logo. It’s a free advertisement for the coffee chain. Will people be totally persuaded to go to Starbucks for their coffee over Dunkin Donuts? Not necessarily. But compared to #starbucks’ 32 million posts on Instagram, #dunkin only has 1.6 million posts. Starbucks has been serving its iconic coffee drinks for over 30 years, giving the company an obvious advantage over small family-owned coffee shops. But the drinks are also made with ethical ingredients, which the company strongly advertises. The consumer always wants an ethical background in what they are buying, and Starbucks has taken this to the next level. 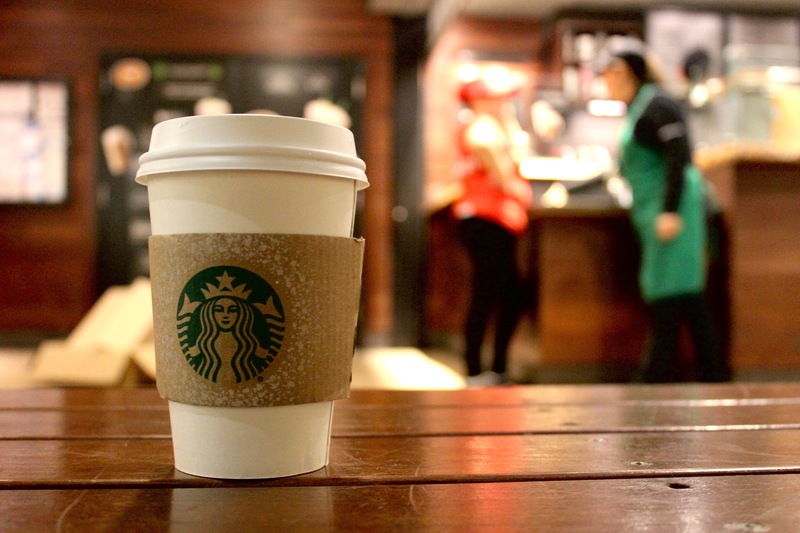 On its website, Starbucks has a tab just for social impact. You can look up from here how the company interacts with its suppliers, maintaining a transparency with its customers by allowing them to see the origins of their drink. College of Business Professor Diane Impagliazzo praises Starbucks for marketing its brand through customer service and personalization. “Through their unwavering commitment to excellence and their guiding principles, they bring the unique Starbucks Experience to life for every customer through every cup. Their marketing has been consistent for many years and everyone recognizes the brand In addition, both their coffee and their customer service stand out,” Impagliazzo said. My Starbucks experience always varies depending on the time and day. Sometimes the barista will address me based on the name I give them for my cup. Other times there’s a hyper or deadbeat college student not caring about your craving for a pumpkin spice latte. Or, the service will be so personal that the barista will know you on a first name basis. Their mission statement online claims, “Delivering our very best in all we do, holding ourselves accountable for results. We are performance driven, through the lens of humanity.” The company is not only again, transparent, but also proves its mission through the actions of its workers (well most of the time.) There’s just something about someone knowing you on a first name basis that makes you smile slightly. Starbucks has been offering food and drinks, beating its competition while also keeping up with trends and adjusting its marketing accordingly. Us, the consumers, are almost like unpaid walking billboards because we can’t stop talking about the coffee legend. We just have to post pictures of pretty milk swirling in a cup or a purple or foggy pink drink. The company makes a product that caffeine-obsessed people will buy overpriced and wait for as long as they need. They get their money and a free ad on social media. It’s genius ㅡ simplicity at its best.